Citations and sources in Reunion. Why are there only 255 characters for the citation detail? Reunion has a very clear distinction between a "source" and a "citation." They serve two different purposes. One (the citation) points to the other (the source). In Reunion, a "citation" is a simple record with a simple purpose: a citation points to a source record. For example, when a birth event cites a source, the citation is typically just the number of the source record to which it points. The citation may also contain "detail" which is concise information about where exactly, within a source record, specific information can be found (such as a page number or roll number, etc.). By contrast, the source record contains all the information about the source (whatever pieces of information and/or media items you wish to record). So a source record can be a sophisticated record with multiple fields, or it can be just a single text field. That's up to you. Let's put this another way: A citation is not where you enter lots of text; a citation is not a record made up of lots of fields. In Reunion, the "source" record is where you can have lots of fields and lots of text if you need it: up to 30,000 characters of formatted text per source, up to 50 single-line structured fields per source, and up to 400 images/media items per source. ALL this room is available, if necessary, for each source record. So it's important to avoid the mistake of thinking that Reunion's citation "detail" field is where you need to cram information about the source; instead, put that information into a source record. Again, a citation is just a number -- the number of the source record being cited. And each citation has an optional "detail" field. The purpose of the citation detail field is to record, if necessary, concise information about where exactly, within the source record, specific information can be found. Examples include: "Page 25." or "Stafford Township pg. 5 of 7, line 32." Some people use the citation detail field for this clarifying data; some do not. Some people prefer to put this information into source records, where there is more room, and simply use more source records. Others prefer to use fewer source records and more instances of the same citation number but all with different citation detail. Citations in Reunion look and behave like "in-text references" or "in-text citations" (borrowing from concepts in other disciplines). In reports, citations are imbedded in text as sequential superscript numbers. These appear "inline," next to the material they support. The citation can optionally include the citation detail. But, remember, the citation detail is only a small string of clarifying information. Don't confuse "citation detail" with "source detail." Let's review: in Reunion, a citation is a simple record that links information to a source record. Often the citation is just the number of a source record; sometimes the citation includes short, one-line detail. The citation record doesn't include the full scope, text, and media of the source record; instead, that information goes into the source record, which is a different entity, a different kind of record. Keep this distinction in mind, especially if you're coming from another genealogy app where a "citation" is actually a source record (and "citation detail" is actually "source detail"). In Reunion, the citation detail field is limited to 255 characters because its purpose is for recording a small piece of information about an exact location within the source record. As you're entering information, citations are linked to the field to which they apply. 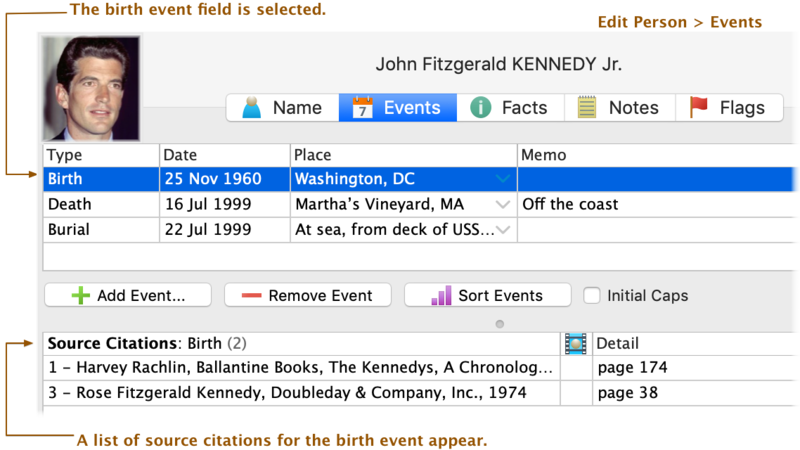 For example, in the Edit Person panel, a list of citations for the birth event appear when the cursor is in the Birth event field. In the family view, citations appear as superscript numbers, much like in reports. Source records appear at the end of the report (as endnotes) or in a different section of the report, as is the case with web-based reports. Within the Reunion app, source records appear in a list (either in the sidebar or the List window) or individually (in the Source window). Each source has a unique number. One of many ways to cite a source in Reunion is simply to drag and drop (drag a source from the list of sources and drop it onto a birth event, or onto a person's name). Other methods are explained in your Reunion user guide. Remember the point of citing a source is to help your reader (or yourself) find and verify what you've entered. There is no one correct way, but we recommend choosing one way and sticking with it. It's important to be consistent when citing sources, no matter what particular system, nomenclature, fields, or method you use. Some people simply document their sources in person Note fields. Some people rely heavily on source records and have thousands in their database. Some people have fewer sources, and rely more on citations and the citation detail field to distinguish. Some people like to scan documents, such as census images. However, some users assume that those images can be retrieved online in the future, and thus cite the census without an accompanying image. Reunion is very flexible; it lets you define and customize person records, family records, and source records (or templates) facilitating the documentation of sources of information in the manner that suits your preference.